This Monday was a public holiday here in Perth, and we had plans to take in Kings Park and the wildflowers and go for a leisurely walk around Lake Claremont, relaxing and generally enjoying the extra free time. Until, on Sunday night, my boyfriend pulled a bag out of the wardrobe. “Do you think this is mould?”, he asked, showing me some white marks. Hmm, it did look like mould. We pulled a few more things out. More mould. The further we looked, the more we found. Arghh. And so it was, we were able to make the most of the glorious weather that is so long overdue… by putting on load after load of washing, and drying it all thoroughly in the sun. The rest of the day we spent indoors, scrubbing everything with vinegar and tea tree oil. We must have washed at least 10 loads. I was already well aware that I have far too many clothes, but having to wash every single item certainly brought it to the forefront of my attention. Prior to the disaster, we thought we needed more hangers. Having washed EVERY SINGLE ONE I can now report that we have far too many hangers, and actually need less clothes to solve the problem. We have 91 hangers – I just counted. That is too many. I love the idea of minimalism, and especially after devoting three days to washing and cleaning I’ve never been more sure that I need less. The problem lies in how I actually get there. So I ‘d like to introduce you to my wardrobe. Well, our shared wardrobe. This is the post-washing-and-culling-of-some-really-old-stuff wardrobe. Believe it or not, prior to this I had actually had a bit of a clearout and sold a few bits and pieces on eBay. My mind seems convinced that by listing three things on eBay my wardrobe contents will half. Unsurprisingly, it stubbornly remains in its fully packed glory. I’ve already committed to the “buy nothing new” commandment. In fact this year I’ve only purchased three or four items. The problem isn’t stopping stuff coming in. It’s what to do with the stuff I already have. The hoarder in me just wants to buy nothing new for the next three years and gradually wear everything out. The minimalist in me wants the wardrobe contents halved. The housework-despiser in me does not EVER want to do 10 loads of washing back to back ever again. I’ve heard tips like turning all the hangers backwards, and then once you wear something turn the hanger back round, and at the end of 6 months ditch the things that weren’t worn. I could try this, but I actually like everything in there, and I’m stubborn enough to wear everything once. At least I think I am. Maybe this would be a good experiment. I’d love it if anyone wants to share with me their thoughts. 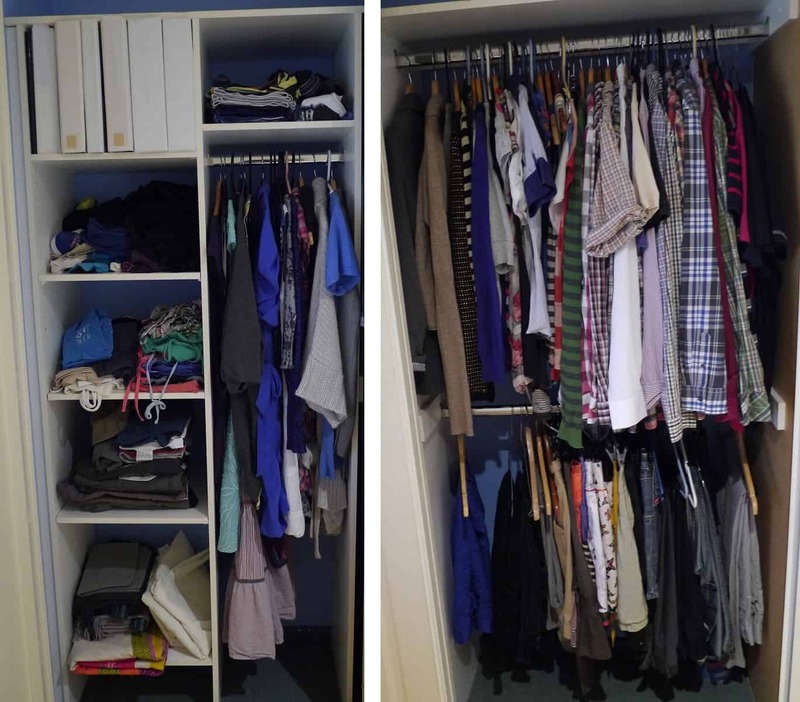 How does my wardrobe compare with yours? Is there anything glaringly obvious that I’m missing? How much stuff is a reasonable amount to have without feeling restricted? If you’d like to give me advice, talk some sense into me, give me any tips or inspiration, all will be greatly received. I’m not sure I can do this alone! Re sorting clothes. I have something that worked for me but might not for you. I figured out the size I wanted my wardrobe, then I hung some empty hangers in there with enough space that it looked like it was in a shop (NOT good sammies) you know lots of room to see etc. I used all my nice hangers – wooden and crocheted ones. Then I hung up what I wanted to keep and was not allowed to add any new hangers.I basically laid everything out from “I can’t live without this” to “does this really belong to me” and hung up the items based on the number of hangers. From memory I even left some empty. Now I have a one in one out rule. For the stuff in shelves I divided them in to piles (eg t shirts, singlets, long sleeve) and decided (without looking) how many I thought was reasonable for me. Eg three pairs of jeans. Then fold really nicely and enjoy the colours etc. Having said that I now have a very strange situation – a wardrobe that is too small in hanging space and too big in shelves. Plus having lost 12 kilos nothing fits . . . . So I am letting myself buy second hand stuff in my size if I want (or need) to and once we have our new bedroom I will start all over again . . . . .
Also I am really really really good at forcing people to put clothes on and going “na dump it” or “you can’t do without that”. Why don’t you have a party? Or a series of events where you did a wardrobe sort for each other ie you one month, someone else the next . . . .
PS if that is you and Glen where does he put his stuff? If those clothes are both of you, it doesn’t look like too much space to me. Thanks for your comments! Yep that is mine and Glen’s stuff… but it is very (too) tightly packed in there! I agree with you that the ‘bit-by-bit’ method doesn’t work; that’s what I’ve been doing for months and I haven’t got very far at all. I like your hanger method – deciding how much I want in there and then filling, I just need a bit of time to get my mind around it. I know I need to cull, but I also need to give my mind some time to adjust to the idea! Maybe I’ll let you come round and go through my stuff – I’m just scared you’ll make me get rid of too many things!!! I started out by using Project 333. But I eventually pared things down even more. What was a big help to me was having a starting goal. Like you, the whole thing otherwise seemed too overwhelming! Thanks for that, haven’t heard/seen project 333 before but I love the idea : ) Thanks for sharing. I hadn’t heard of it either, but I really needed some kind of starting point. So it helped me. Hope it works for you too! Ugh. I can relate. I recently discovered a large silverfish eating one of my favourite t-shirts (that I’ve had for about 7 years). I have piles of clothes in my wardrobe that I intend to donate to charity that I now realise have been sitting there, ready to donate to charity, for more than two years. This is not to mention my large “floordrobe” (including in my bathroom, where my t-shirt had been for a couple of days). I think at least 75% of the contents of my wardrobe have to go over the next couple of weeks. I’m going to throw a big “Spring Clean” party and cull a whole bunch of clothes (some are designer, quite expensive but can’t be bothered selling them on ebay), magazines and books to friends and family. The rest will go to charity shops or be used as cleaning rags. PS I love the term ‘floordrobe’ – never heard it before! I have been thinking of doing a clothes audit for ages – when (if) I get round to it I will post my findings.